AMY'S ORIGINAL BRIDAL HANGERS: November Giveaway! 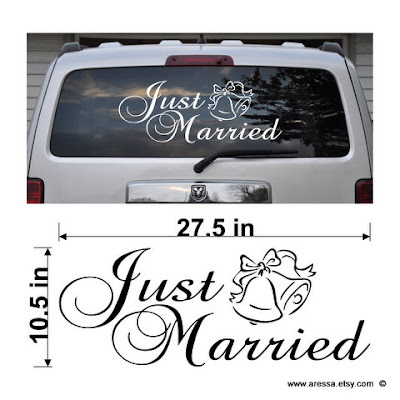 My new blog giveaway is for one of the "Just Married" car window decals! You could be the first to show off our new product! The contest starts November 7th and runs through November 14th. The winner will be announced on November 15th! It's pretty easy. All you have to do is start following me on Twitter: http://twitter.com/aressa1 , start following my blog, and comment on this post while leaving your email address. I want to be able to contact you if you are the winner! Sounds pretty easy, doesn't it? So, what are you waiting for? Go on and get signed up!!! I was already following you actually :) (that sounds slightly stalkerish...following on twitter). Love the new decals! Follow your blog and follow you on twitter!!! What a great give away. Thanks. I have followed you on twitter and subscribed to your blog. I am also going to take a look at your shop. I love hand painted items. The bridal gown hangers are very cute!! Would love to win this, what a great decal!